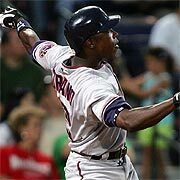 I heard a lot of trade talk at the beginning of the year regarding Soriano and his preference to play 2B instead of OF. I guess that is behind him. With guys like Soriano and Zimm, the heart of that order is set for years. I haven't followed them closely enough to know what their pitching looks like, but they have a couple all-star type guys to build around. Well, I'm hoping it's behind him anyway. It's hard to judge our pitching because we've had so many injuries. John Patterson will be really good, but he's been hurt on and off all year. That forced O'Conner, who should be good, to come up to the majors too early. We also have Brian Lawrence from the Padres, who's out all year. And we have plenty of veteran trade bait.